In the time of William Shakespeare, there were commonly reckoned to be five wits or five senses. At that time, the words "sense" and "wit" were synonyms, so the senses were known as the five outward wits. This traditional concept of five senses is common today, and Extrasensory perception is often called the sixth sense. The traditional five senses are enumerated as the "five material faculties" (pañcannaṃ indriyānaṃ avakanti) in Buddhist literature. They appear in allegorical representation as early as in the Katha Upanishad (roughly 6th century BC), as five horses drawing the "chariot" of the body, guided by the mind as "chariot driver". Depictions of the five traditional senses as allegory became a popular subject for seventeenth-century artists, especially among Dutch and Flemish Baroque painters. A typical example is Gérard de Lairesse's Allegory of the Five Senses (1668), in which each of the figures in the main group allude to a sense: Sight is the reclining boy with a convex mirror, hearing is the cupid-like boy with a triangle, smell is represented by the girl with flowers, taste is represented by the woman with the fruit, and touch is represented by the woman holding the bird. "beings with one sense are those that have the sense of TOUCH. Beings with two senses are those that have the sense of TASTE along with the above. Beings with three senses have sense of SMELL in addition. Beings with four senses have sense of SIGHT, along with the above. Beings with five senses have sense of HEARING,in addition. The beings with six senses, have a MIND, along with the above." Grass (Pul) and Trees (Maram) have single sense, that is the sense of touch. Similar beings also form part of this branch (kilai). Termites (Sidhal) and Ants (Erumbu) have three senses, the sense of touch, taste and smell. Similar beings also form part of this branch (kilai). Crabs or Crustaceans (Nandu) and Dragonfly or Beetles (Thumbi) have four senses, the sense of touch, taste, smell and vision. Similar beings also form part of this branch (kilai). Horses, Elephants, Pigs (Maa) and Other similar animals and birds (Maakkal) have five senses, the sense of touch, taste, smell, vision and hearing. Similar beings also form part of this branch (kilai). Only humans have six senses, the sense of touch, taste, smell, vision, hearing and mind. Similar beings also form part of this branch (kilai). Sixth sense, or subtle perception ability, is our ability to understand the subtle cause and effect relationship behind many events, which is beyond the understanding of the intellect. 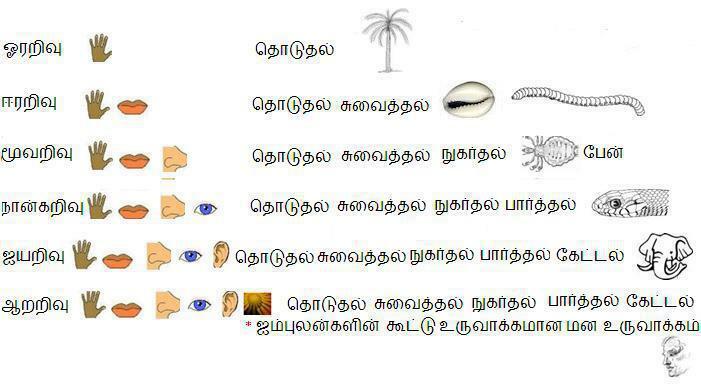 Extrasensory perception (ESP), clairvoyance, premonition, intuition are synonymous with sixth sense or subtle perception ability.Tholkappiyam is said to be the First in the world to describe the sixth sense which related to external body parts. 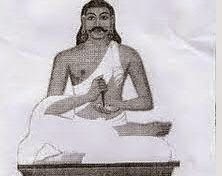 Tholkappiyam verses explanation above is truly an amazing classification and proves that our Tamil ancestors not only an expert in literature and grammar, but obtained higher spiritual knowledge that is progressively of more universal need and of lasting importance in terms of a time span of centuries. There are some errors in his above classifications,Considering the time or period he made these classifications,We can understand these mistakes.For example, beetles have no nose, they use their antennae to smell things.Similarly,Snails are strange-looking creatures with shells and large stalks sticking out of the tops of their heads. Because most snails are small, it can be difficult to see their primary features. However, snails do have eyes and vision, though the exact location of the eyes and their use depends on the specific type of snail. Snails don't rely on sight as much as humans, but it's still one of their senses.